Max Ernst once described how he struggled to make pictures and with what he called his "Virgin complex" when faced with a blank canvas. 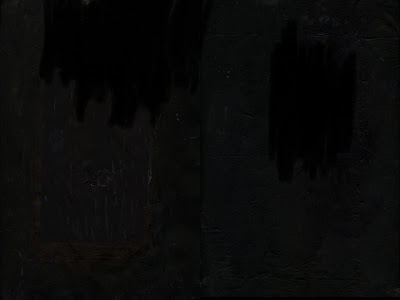 The digital void of the blank page in a computer program offers similar challenges: the white page as much as the black one: voids, darkness, the empty spaces of a Malevich white on white painting or a black on black Rodchenko abstraction. To get round the digital blank "canvas" other materials can be scanned and manipulated. 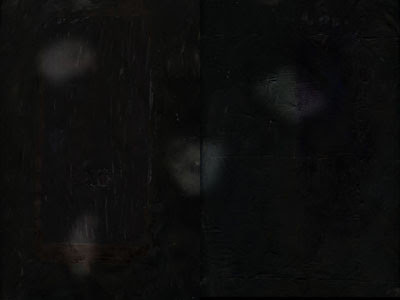 Is the black of a monitor screen the same as lamp black oil paint or acrylic? 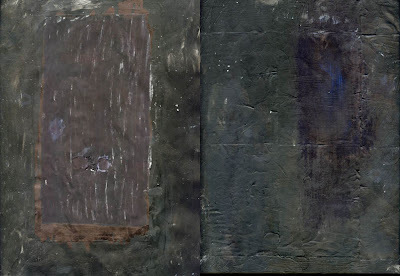 This sequence of images were produced through the use of collage and painting. Here we see the use of mixed-media; card,glue and paper. The paint is a mix of lamp black and Prussian blue. The use of these colours are largely inspired by the work of Richard Diebenkorn. Other abstract painters are influencing this approach: notably the abstract expressionists and the early abstractions of Rauschenberg. 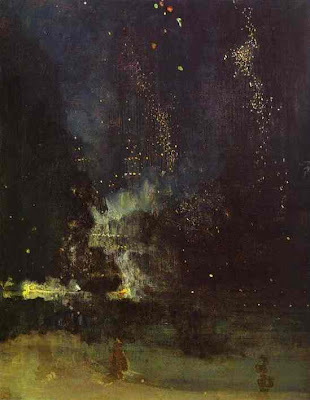 It does loosely resemble Nocturne in Black and Gold: The Falling Rocket (above) by Whistler.In response to the picture Ruskin said that Whistler was “flinging a pot of paint in the public’s face " . The format of this piece developed like this and became a digital collage. 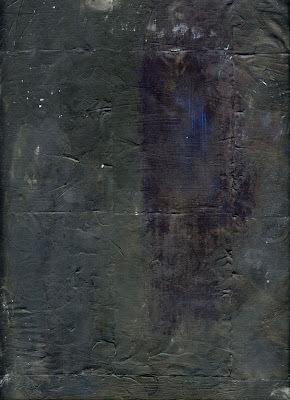 The composition recalls the work of Ad Reinhardt, Motherwell, Guston and Newman. Details disappear in an attempt to modulate brightness, contrast and colour. 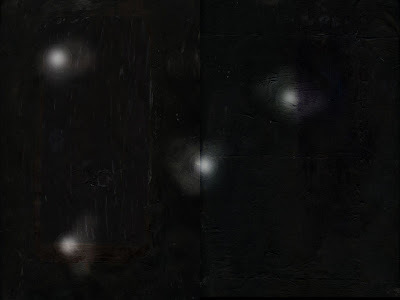 The modulation of some of the areas of the picture result in the appearnce of orbs of light. By creating a pooling of light the work suggests a connection between the various media being used. The light pools recall Vermeer’s pictures where he employed a camera obscure. It connects early lens and photographic technology in one space; one picture. Damn those Computers (and other things)! From Leonardo’s "Treatise on Painting"
John is a lecturer in Media at Lincoln University and an artist. He began his real love for education at West Park College, Smethwick 1988-90, before going on to do his National Diploma in Art and Design at Stourbridge College in 1990. He went to Humberside Polytechnic and graduated in 94 after it had changed to Humberside University. From 1994-99 exhibited his work in a number of group shows. He also worked with a number of art groups and organisations before in 2000 becoming a university lecturer (thank you Jenny Wolmark!). John worked in art and design for about eight years before moving into the School of Media. He makes digital images. This particular blog is a response to work started during the MA in Digital Imaging and Photography at the School of Media, Lincoln University 2009-11. This blog deals with a wide range of topics to do with visual culture: photography, art, theory, technologies and media practice.